The story of four women who organized labor unions in Texas in the 1930s, 40s, and 50s. 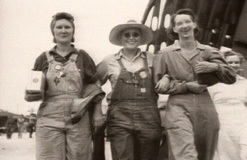 “Talkin’ Union” is an oral history film about four Texas women and their union organizing activities in the years 1930 through 1960. The women are Alberta Snid, participant in the 1938 Pecan Shellers Strike in San Antonio, the largest strike in the Southwest during this period; Charlotte Graham, leader of the 1935 Dallas garment worker strike and member of the International Ladies’ Garment Workers Union; Olivia Rawlston, president of the Black ILGWU local in Dallas for twelve years; and Andrea Martinez, leader of the ILGWU in Laredo during the 1950s and 1960s. Talkin’ Union raises significant issues about women in the Texas workforce. In 1930, one in four women worked outside the home. Today, one in two women work. The problems women faced in 1930 are the problems they face now: low pay for women’s work with few benefits and poor working conditions. Though some of their attempts to win better pay and improve working conditions failed, they remain convinced of the importance of their experience in their own lives and the lives of others. The documentary is an hour long and is broken into four segments for internet viewing purposes. It is black and white. It was produced in 1977 by People’s History in Texas with the use of National Endowment of the Humanities Youth Grant.